Open source supporters and companies are teaming up to offer the next general of video delivery. The Alliance for Open Media (AOMEDIA) is made up of companies like Mozilla, Google, Cisco, Amazon and Netflix, and on a mission to create an open video format and new codec called AV1. In a blog post about the AOMedia Video, or AV1, video codec, Mozilla technical writer Judy DeMocker laid out the numbers; within the next few years, video is expected to account for over 80 percent of Internet traffic. And unbeknownst to many, all of that free, high-quality video content we’ve come to expect all across the Internet costs quite a bit for the people providing it via codec licensing fees. The most common, H.264, is used all over the place to provide the compression required to send video quickly and with quality intact. In 2013, Cisco open-sourced the H.264 codec and Mozilla Firefox uses the open-source binary, saving Mozilla an estimated $9.75 million in licensing fees yearly, according to DeMocker. Since the open-sourcing of H.264, it’s been branched by Google as VP9, by Cisco themselves as Thor and by Mozilla as the Daala Project. But in 2015, with the backbone of Google’s VP9 codec, those three companies, along with AMD, ARM, Intel, NVIDIA, Amazon and Netflix joined forces to start AOMedia, now responsible for their collaborative video codec, AV1. 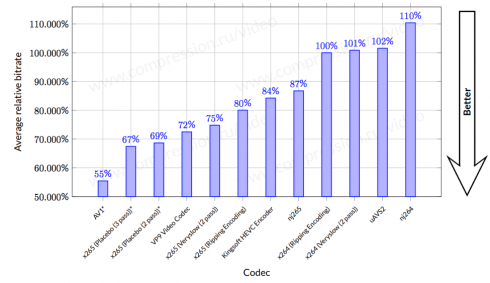 And, oh yeah — in a study by Moscow State University, AV1 delivers about 30 percent better compression than even high-efficiency codecs like the supersedent to H.264, the H.265-based x265 codec. Learn more about the project on its Open Hub repository.